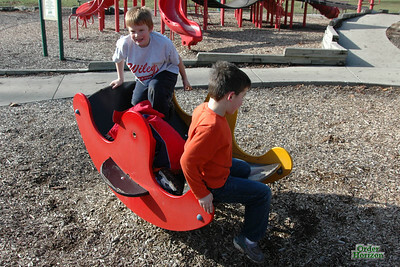 We all went over to the park and took Jack along in an attempt to promote physical activity on the part of Corwin. It worked out reasonably well, as I also took a high-tech child exercise device, my camera. I managed to chase Corwin and Jack all over the park with very little effort on my part. Eventually I relented and played some soccer with them, which wore me out a lot faster tham because they traded off being goalie but I had to play forward the entire time. Charles had an OK time, although he managed to scrape his nose in a major way about 10 seconds after we arrived by tripping and falling on a new sidewalk. After a bit of comforting he was back in action. At one point I was trying to get a picture of Charles and he was running away as well. Charles: Don’t take my picture! Charles: I not like pictures. Dad: Why? It doesn’t hurt when I take your picture. Charles: Corwin and Jack don’t like it. And they both my best friend. Dad: What about Chloe? I thought you liked her. Charles: She my best friend too. Jack: Corwin! Charles has a girlfriend!